One of my favorite spots to decorate for Christmas is the table. Since all of our family and friends up gathering around it, sometimes more than once throughout the season, it’s very rewarding to put together a table setting that will be enjoyed by everyone. It really helps set the mood for the holiday and get everyone into the festive spirit. The centerpiece is what brings the whole table setting together. In fact, if you aren’t sure what you want to do with your table setting, a good idea is to start with the centerpiece and then let it inspire the rest of the table. 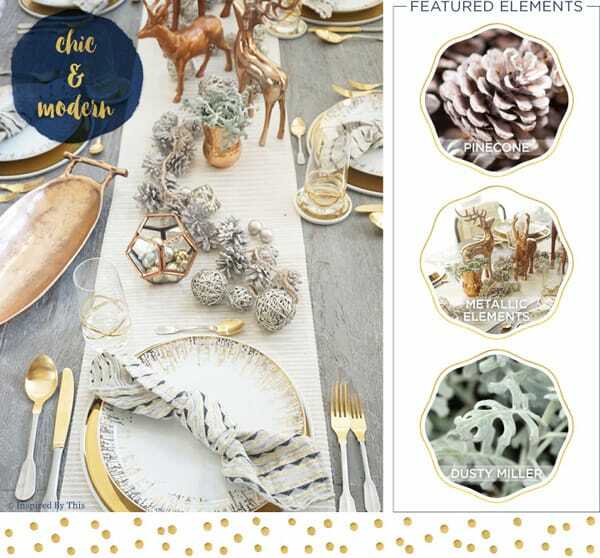 For a Christmas centerpiece, there are so many great elements to work with that you can easily suit it to your own personal style and make it your own. 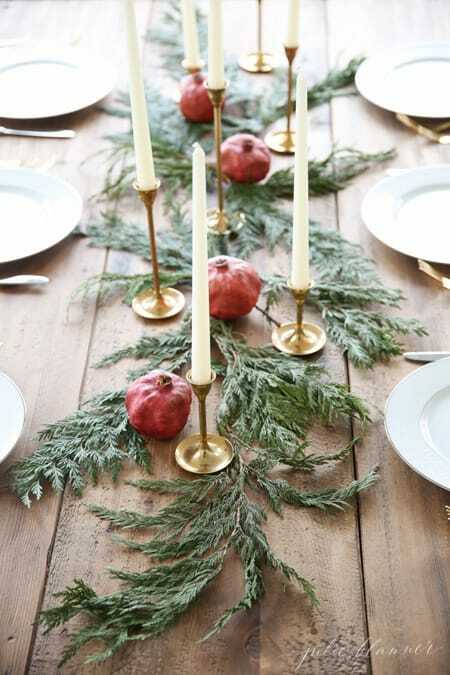 Here are 10 Christmas centerpiece ideas that range from simple to extravagant, rustic to glamorous. They offer some great inspiration for concepts, elements, and color schemes that can help you find a direction for your own. 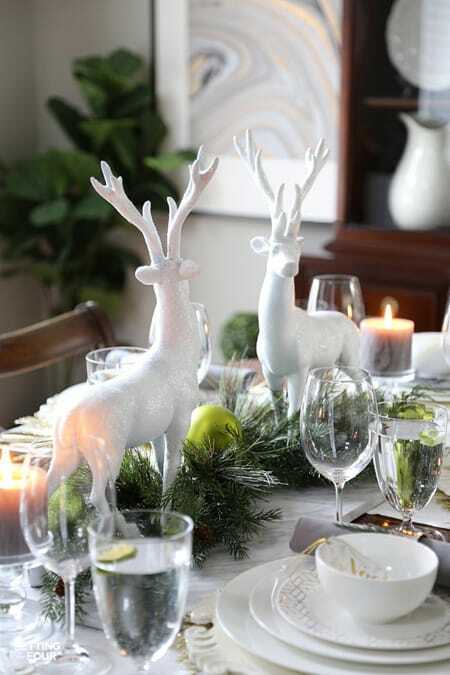 Two white reindeer serve as a festive and contemporary centerpiece. Ground them with some swag and candles to set the scene. 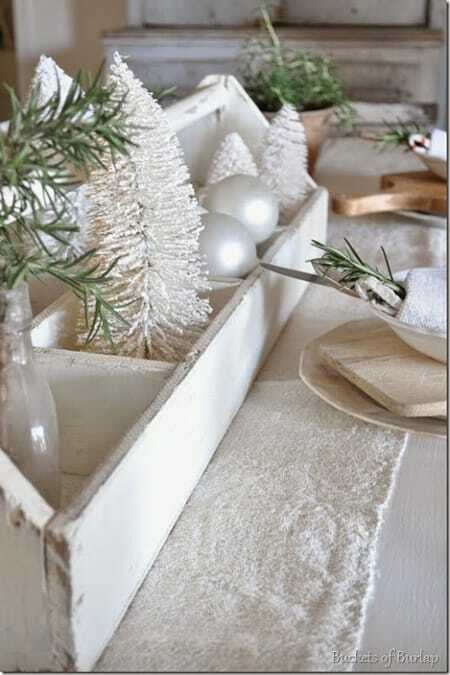 A faux fur runner adds a touch of luxury to this rustic Christmas centerpiece, which consists of a distressed tray and some white Christmas trees and ornaments. Simple, yet full of charm. A few white feathers add an unexpected touch to the green swag and give it some depth, while the gold ornaments and silver vases bring the glamour. Christmas tree-shaped decor in a bed of swag are a lovely minimalist approach. For a rustic vibe like this particular centerpiece, choose trees with rough textures like wood and twine. For a more glamorous vibe, go with a smooth, glossy texture. 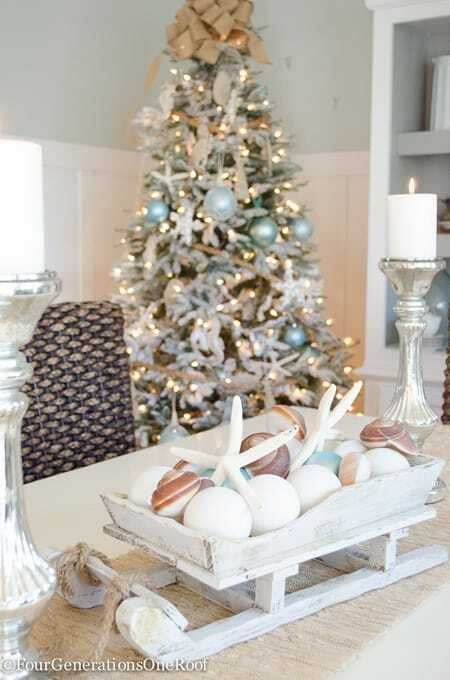 This adorable sleigh is so charming and perfect to hold ornaments and seashells for a coastal Christmas centerpiece. This centerpiece is so simple and elegant with some sparse swag, candles for glamour, and fruit to bring in pops of color. 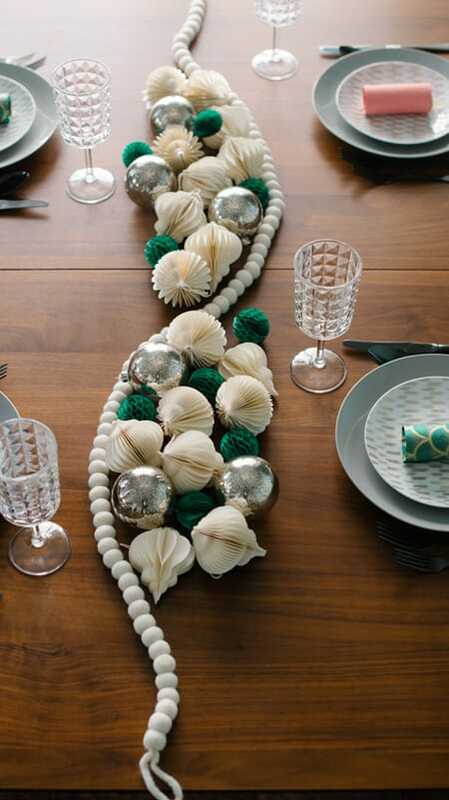 Felt garland, tissue balls and ornaments are an alternative to the traditional greenery for a lovely centerpiece. 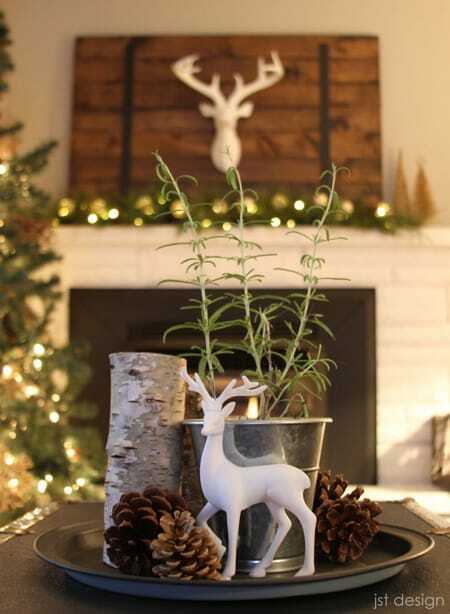 Gather some rustic elements like pinecones, a wood stump, some greenery and a reindeer for a simple yet charming centerpiece. 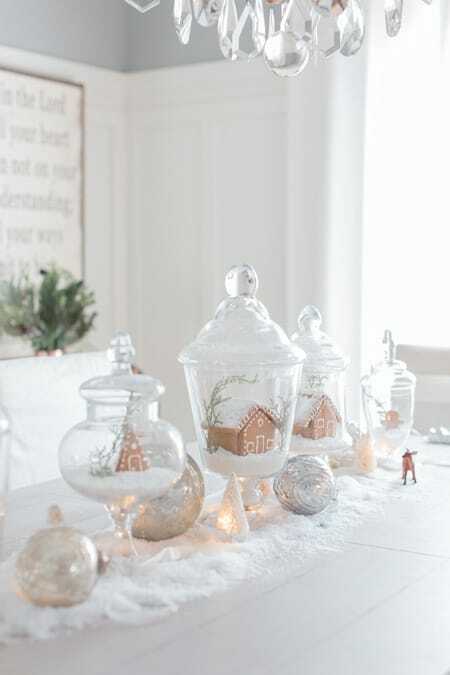 How adorable are these little gingerbread houses in apothecary jars? Some “snow” along the bottom sets the scene with tiny lighted trees and metallic ornaments. 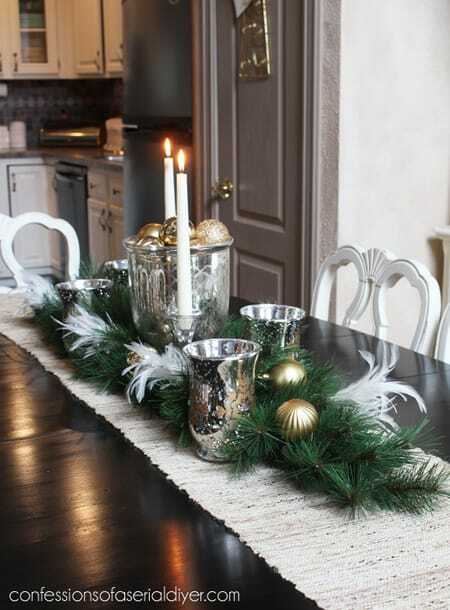 Mix rustic accents and glamour together to create a centerpiece that captures some of the best of Christmas.